I thought I had pm'd you but can't find a record of it. 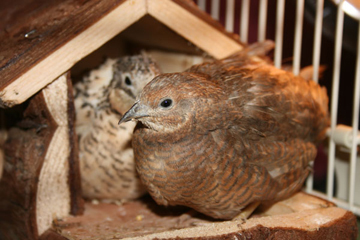 How many female quails can you spare, we are looking for 5? let me know where and when we can come and collect them if you have some and obviously how much. 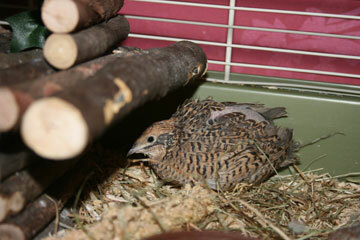 We are thinking abour Japanese quail as well, do you know anyone who sells them. no,I haven't got a pm from you yet.5 females is not a problem,i'll pm you the details.I don't want to sell any of my whites at the moment,as i've only got 1 male and 1 female,but I've plenty of others. Also at the moment I'm hatching out chocolate pied cpq,so far 1 has broken out of it's shell and is now in my brooder. They can fly by 10 days old,so should be ready to go to new homes by 3-4 weeks old,I don't know if you'd like some of those.They are very pretty. Oops,forgot the links for adult japanese,there are two places I would recomend,one is called Foster's Poultry and they are based in Gloucestershire www.fosterschickens.co.uk/ .The other is in Devon, www.gameforanything.co.uk I also know of someone in Staffordshire who has adult japanese,the lady I got my ducks from. Thank you for yesterday, you were very kind. 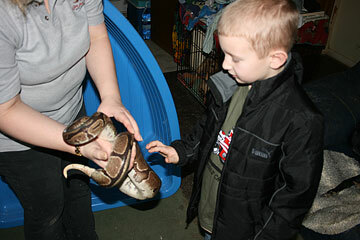 Harvey enjoyed himself so much, He said to his mum, 'I could do that again couldn't I ?' Because of the Quail 'fielding' skills that he aquired at your house, he helped to catch the ladies when we got home and put them into their cages! Here are your quail settled in their temporary home, we are searching for a cage to suit as, at the moment, we have been swapping and changing them to see who gets along with whom! 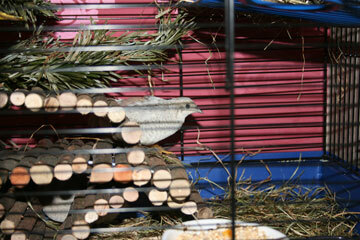 I have also included a picture of Harvey with FANG, I hope the other forum members don't mind that he hasn't got feathers! This is the one that Harvey has decided to adopt. He has named it after his sister Daisy. Hi Annie,it was lovely to meet you,Ady and Harvey.I'd love to see you all again, or meet up somewhere.Harvey is always welcome,he's amazing and so good with animals,a real natural. They look settled in their new temporary homes all ready,hope they start laying for you soon.I cleaned my others out after you'd gone,they were so pleased they tipped the water over and soaked it all again ,I think they are trying to bathe in the water.They then all escaped ....for a change . 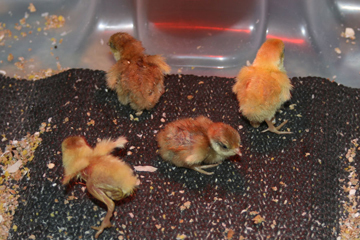 Your pictures have come out really well,the chicks are still dashing about everywhere,they make a mess as well . oh for pets that tidy up .